Are you following A/B testing best practices for your opt-in marketing campaigns? If you’re not, the chances are you’re missing out on major opportunities to grow subscriber numbers and improve lead generation. Website split testing is an essential conversion optimization practice, but it’s not always easy to be sure you’re doing it right. This guide will help you with those issues. We’ll share some A/B testing best practices to help you get reliable results from your split testing strategy so you can attract more leads and boost subscriber numbers. There are several reasons why split testing website marketing campaigns makes sense. Web A/B testing helps you make decisions based on data, rather than guesswork, so you know for sure when a particular marketing tactic or campaign is working. It also helps you avoid the case study trap. That’s when people read case studies and copy the tactics mentioned, without knowing for sure if they’ll work for their own business. Here’s a hint: every business is different and you can’t assume that what worked for others will work for you. When you A/B test a website marketing campaign, you can experiment with different ideas. This is useful because sometimes a small change can make a big difference to the results you get. One of the key areas to test to increase lead generation and subscriber growth is your optin form. That’s because this is where people sign up to become subscribers or leads. 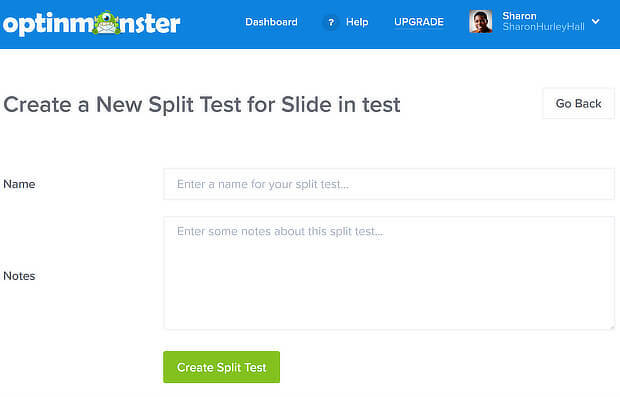 Learn more in this guide on which split tests to run. One of the most important website testing best practices is to test items that make a difference to the bottom line. To find your most visited pages in Google Analytics, go to Behavior » Site Content » All Pages. Once you know what these are, you’ll know where to place email subscription forms and lead magnet optin forms. Another of the best practices for A/B testing is to get the sample size right. If you don’t perform your test on enough people, you won’t get reliable results. That also means that any decisions you make on the basis of that data may be flawed. One of the best ways to work out the ideal sample size is to use Optimizely’s sample size calculator. Put in your current conversion rate, plus the percentage increase you’d like to see, then it will automatically calculate the number of visitors you’ll need for your A/B test. With website split testing, there’s another important measure of data reliability called statistical significance. In simple terms, this is a way of determining that your results aren’t due to random chance. 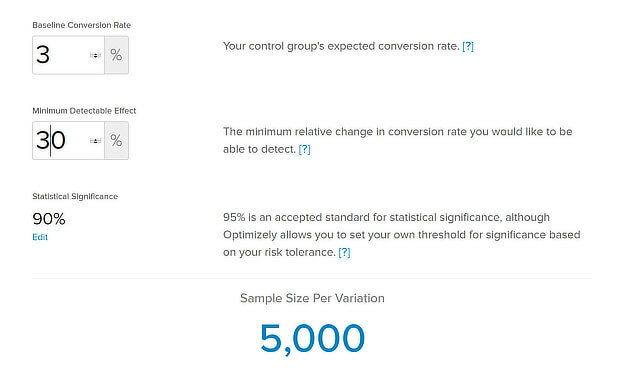 To identify statistical significance for your A/B test, use Visual Website Optimizer’s statistical significance tool. 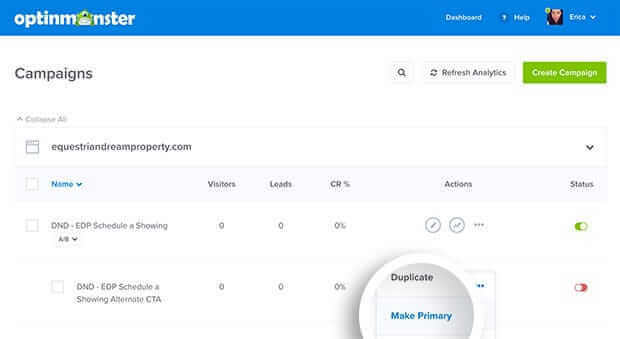 Type in the number of visitors you’ve tested for your original marketing campaign (called the control) and the one you’ve changed (called the variation), then press the Calculate Significance button. You’ll get a result that shows the P-value (another measure of reliability), and tells you whether the test has statistical significance by showing Yes or No. Pay attention to the confidence rating, which is the likelihood of getting real results from any changes you make. The industry standard confidence rating is 95%, though in the Optimizely tool shown in the last tip, you can adjust it to a level that you’re comfortable with. When you start your testing without a hypothesis, you’re wasting time. A hypothesis is an idea about what you need to test and why, and what changes you’ll see after you make any changes. With this structure in place, you’ll know the scope of your test and when it succeeds or fails. Without it, your testing is just a guessing game. Because we observed [A] and feedback [B], we believe that changing [C] for visitors [D] will make [E] happen. We’ll know this when we see [F] and obtain [G]. Because we observed a poor conversion rate and visitors reported that our optin form was too long, we believe that reducing the number of form fields for all visitors will increase newsletter signups. We’ll know this when we see an increase in newsletter signups over a 2 week testing period and get customer feedback that shows that people think the optin form is less complicated. Test scheduling is one of the most crucial A/B testing best practices. Here’s why: if you’re not testing like against like, you can’t trust the results. In order to get reliable results, you’ll need to run your A/B tests for comparable periods. Don’t forget to account for seasonal peaks and troughs. Don’t test traffic on Black Friday against traffic on an ordinary day in mid-January. To find out how your traffic performs over a couple of months, login to Google Analytics. Go to Audience » Overview, and change the period to Last 30 days. Then click on Compare to and the previous 30 days will automatically be selected. Click Apply and you’ll get a quick snapshot of traffic patterns. 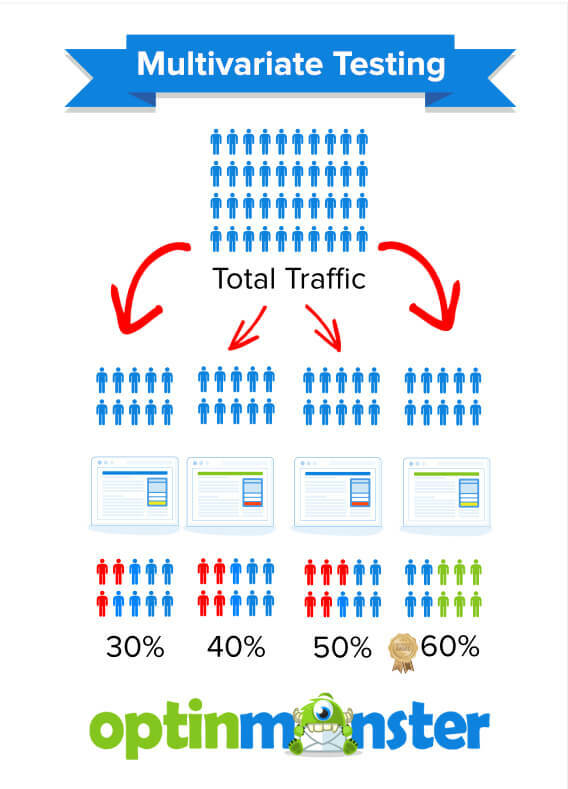 This will give you a better idea of traffic patterns so you can select an ideal period to run your A/B test. Test duration is another essential factor in determining the reliability of your results. 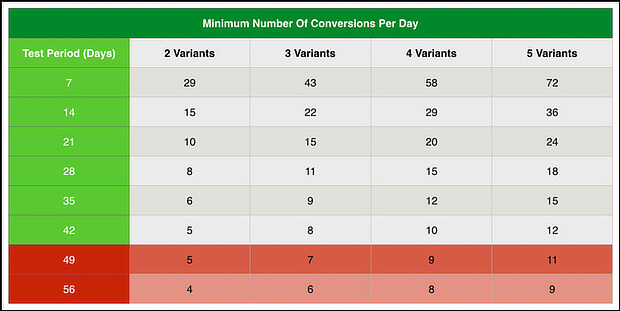 If you’re running a test with several variants and want 400 conversions, you’ll need to test for a longer time than for a test with just a control and a variant, and 100 expected conversions. Use this chart from Digital Marketer to work out the ideal duration for split testing your website optin forms. It’s easy to get so excited about the results you’re seeing during a test that you want to rush out and implement more changes. If you interrupt the test before the end of the ideal testing period (see the previous tip), or introduce new elements that weren’t part of your original hypothesis (see tip #4), your results won’t be reliable. That means you’ll have no idea whether one of the changes you made is responsible for a lift in conversions. One golden rule of A/B testing forms and web pages is: test one element at a time. If you’re testing an optin form for marketing, test the headline OR the CTA OR the number of form fields. That’s the only way you’ll know for sure if that ONE element makes a difference to lead generation or subscriber signups. If you test more than one element, then you need multivariate testing. We explain the difference in our guide to split testing vs. multivariate testing. Related to that, don’t test too many variations at once. That’s a classic split testing mistake. As you saw in the Digital Marketer table, the more variations there are, the longer you have to run the tests to get reliable results. A/B testing best practices suggest you test between 2 and 4 variations at the same time. That gives the best balance of test duration and efficiency. We’ve all got gut feelings about how our marketing is performing, but the great thing about split testing is that it gives you data to back up those feelings – or to show that you’re wrong. Never ignore the data in favor of your gut. If you’ve followed our advice on how to create split tests, you’ll get reliable data that’ll help you to improve conversions. Our last tip is always be testing. Once you’ve got enough data (say, for at least a few weeks) from your original campaign, you can start using A/B testing to improve your results. Incremental changes can soon add up, as many OptinMonster customers have found. 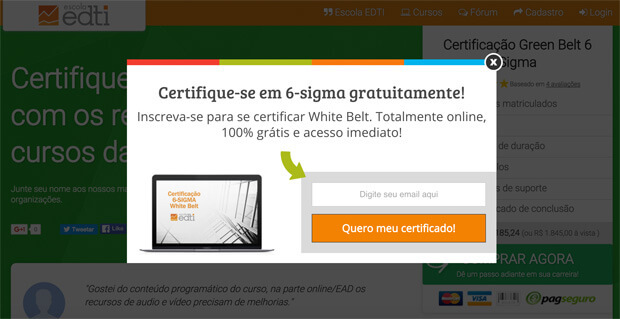 Escola EDTI used split testing to get a 500% boost in conversions. And Logic Inbound got a whopping 1500% conversion boost by split testing its OptinMonster marketing campaigns. 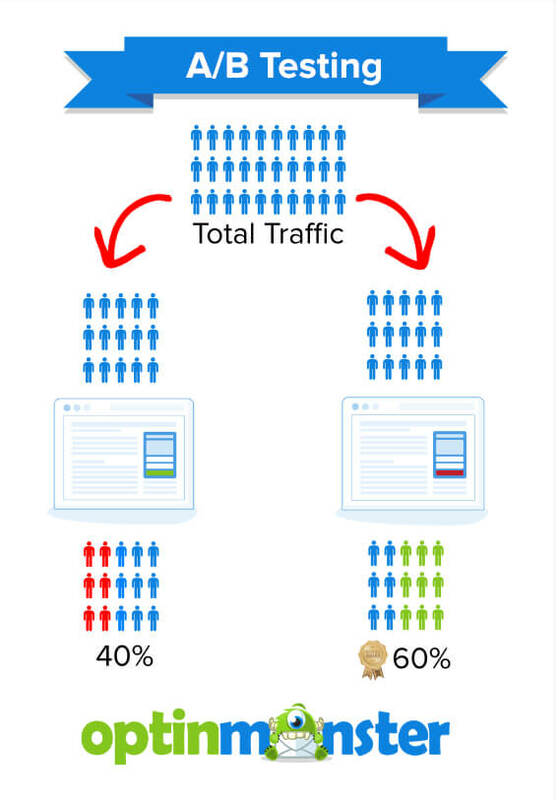 Want to A/B test your own marketing campaigns so you can aim for similar results? We’ll tell you how to do that in this section, with the A/B testing tool that’s built into OptinMonster. Follow our instructions to create and publish your first campaign. From the OptinMonster dashboard, go to the three dot menu. Select A/B Split Test. This’ll bring up a box where you can name your test and add some notes about the change you plan to make. Remember, you’re only going to change a single element. Click Create Split Test. That will take you to the campaign builder. Make your change, then save and publish the campaign as normal. 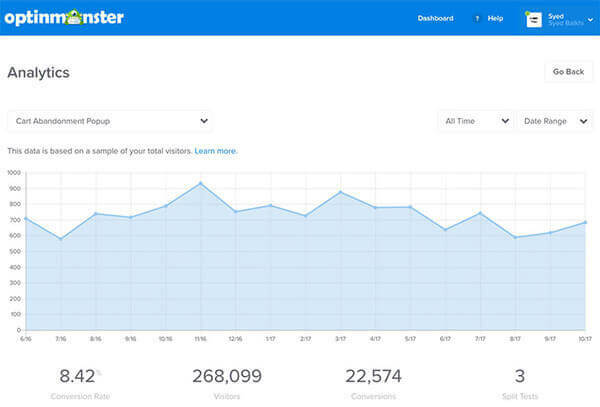 OptinMonster will automatically segment your audience and collect conversion data, which you will see in the conversion analytics dashboard. When you have a winning variation, return to the three dot menu in the OptinMonster dashboard, and select Make Primary to make that the main campaign. You can also toggle the button at the side of the campaign to turn off the other variation. Now that you know how to use the A/B testing best practices that’ll make a real difference to conversions, check out our guide to split testing your email newsletters. And get more inspiration from EczemaCompany.com, who increased conversions by 158% with split testing. Finally, follow us on Facebook and Twitter for more tips and in-depth guides.